The anise swallowtail (Papilio zelicaon) is a large, colorful butterfly with a wingspan of about 3 inches (7.6 cm). It belongs to the family Papilionidae. 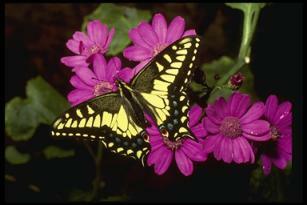 The anise swallowtail's range is West of the Rocky mountains in the United States to the Coast of California. It looks similar to the tiger swallowtail, but the tiger swallowtail has one black stripe that begins on its forewings on each side of its body. These stripes begin at the top of the forewing and entend down the hindwing and come together at the end of the butterfly's body. The anise butterfly does not have these stripes. Anise swallowtail eggs are yellow and are layed on a host plant. When the caterpillar first hatches it is mostly black, but after several instars (developmental stages) the caterpillar becomes very pale green with black vertical stripes and yellow spots. The caterpillar shown in the image is a 5th instar caterpillar. The butterfly gets its name from the caterpillar's preference for a type of fennel (Foeniculum vulgare) that smells like licorice. This plant is sometimes referred to as wild fennel or anise. Other host plants for the anise caterpillar are seaside angelica, cow parsnip, carrots, parsley, and citrus trees. 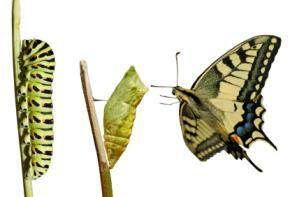 The chrysalis can be either green or brown. The adult butterflies feed on flower nectar. To attract anise swallowtails to your yard plant Butterflybush (Buddleia davidii), asters, oregano, verbenas, and zinnias. Planting the host plants for the caterpillars is also a sure way to attract the butterflies.